I didn't feel in the mood for much yesterday afternoon, so instead of actually doing something constructive, I perused the stash, to find a suitable backing for the applique quilt I am going to quilt next. This dandelion and bee print picked up nicely on the different neutrals and will work well with a light thread in the bobbin. All my new threads got unwrapped and joined in the audition. Looks like I did a good job with the thread selection! 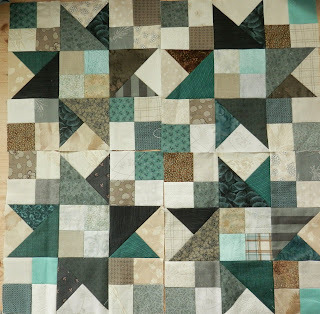 With my head poked into the magic fabric cupboard, I finally started pulling fabrics for a scrap busting quilt that Charlotte has been making. I'm sure she won't mind me stealing one of her photos. It's a Scrapitude block... and you can read more about it here. I knew that there were fabrics in my cupboard that while I don't hate them, they just haven't fitted into my aesthetic style over the last few years. These piles have just sat there looking sad. So I pulled the reds that I have... not many. And added in some browns. Now I have an enormous pile of fabric on my floor. Too much to actually take a proper photo of it. But what do you think. Would you just stick to the blue/green/neutral bundles... or would you add in the red/brown/bird print too? Oh I like the reds and browns added to the mix. I like greens too (I have my eye on that pretty daisy there in the middle!) so I am a bit biased. I would make it brown, red, bird print AND some of those pretty blues (from the right hand side) that appear in the bird print! Has that confused you??? I like the reds, browns and bird print added in as it brings it together with a bit of zing! Maybe a few less browns, but definitely keep all the colours you have pulled in the mix. And I like your backing fabric. It will be neat to see that quilt quilted. I'm BACK! Grab a cuppa!